Obsolete - no longer in iTunes store, no source code given, and was coded for a decommissioned version of the API. 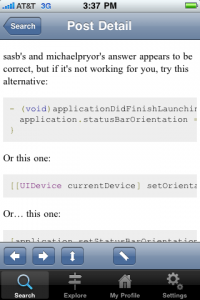 The Geek Question Explorer is a Native Stack Overflow iPhone Application. Adding push notifications for watched posts. Right now you can bookmark posts but I also have disabled code in the client that would allow you to watch a post as well. 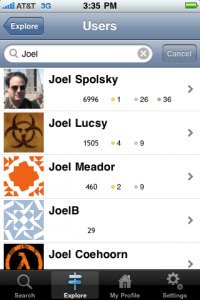 Adding push notifications for tags, etc. I'm not sure how practical this is given the volume but if you have suggestions I'm interested. Adding the ability to use other Stack Exchange sites. I'm not sure how many people will really want to use this outside of Stack Overflow but if there is enough interest I'll add the ability. Move the "Explore" tab to the first position and add things like Hot, Recent, etc to the list. MIT or GPL when I get around to releasing the code. I've planed on releasing the code for over a year but I'm not happy with the quality currently. I will try to get it into better shape with the next version and release it all. 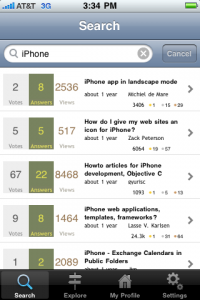 Browse other questions tagged app obsolete iphone .